Got a big batch of homemade soap ready to go? 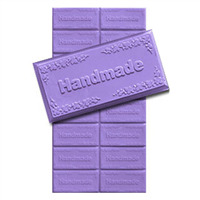 The Handmade Soap Mold Tray will make sixteen rectangle soap bars, each with the word “Handmade” stamped across the top with a floral border. Bar Depth: 4" Bar Length: 1.375"
And by Handgesiedet, we mean “Hand Forged” in German (but you knew that). 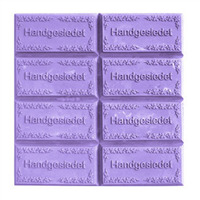 The Handgesiedet Tray Soap Mold with its delicate floral border will help you say willkommen to all your fruende. Dankeschön. 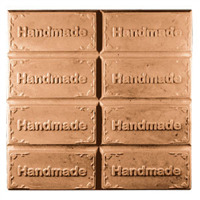 Bar Depth: 1.125" Bar Length: 4"
Show off those handmade soaps with a little bit of bragging! We’ll help you announce to the world all the work that went into your creations with this simple yet elegant mold. 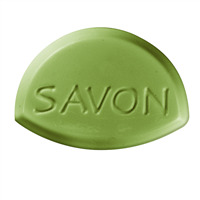 The Handmade Bar Soap Mold is designed in the popular oval shape for universal appeal and features the word “handmade” in a sweet, casual font. 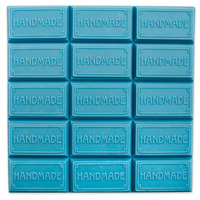 Bar Depth: 1.125" Bar Length: 3.5"
Let your guests know that the soap they’re using is made by you! The Guest Tray Handmade Soap Mold makes fifteen guest sized soaps. What better way to advertise your soaps are handmade than by literally writing that on the bars? 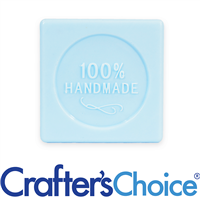 The Handmade Soap Mold Tray is effective and to the point. And with its decorative floral border, it’s pretty, too!